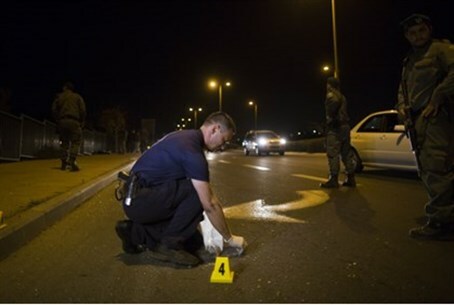 A 2-year-old baby suffered a serious head injury when the car she was in was pelted in southern Jerusalem. A two-year-old baby was seriously injured Thursday when Muslim terrorists hurled rocks at the car she was in, at the entrance to the Armon Hanatziv neighborhood in southern Jerusalem. A Magen David Adom (MDA) team gave the baby initial medical care and took her to Hadassah Ein Kerem hospital. She suffered a serious head injury. Security forces are combing the area in search of the terrorists. Refael Herbst, an MDA paramedic who treated the girl, said: "When we arrived we saw a woman holding a baby aged about 2 years, with a bleeding wound in her head. She was apathetic and in a foggy state of consciousness. We gave her medical treatment on the spot. We were told she had been hit by a large rock as she was traveling in the car with her mother and two brothers, who sat beside her in the car's back seat." "After initial medical care we began the evacuation, and continued giving her care inside the ICU ambulance. On the way to Hadassah Ein Kerem, in the course of the treatment, she began to recover and regained consciousness. When we took her to the trauma room in the hospital she was in moderate condition." Minister Uri Ariel (Jewish Home) reacted to the attack and said that it joins a long list of similar serious incidents. "I strengthen the prime minister's hands," he said, "[in the hope] for a determined, quick action to put an end to the Stone Age." Ten residents of Jerusalem's Issawiya neighborhood, aged 15-17, were arrested earlier this week on suspicion that they threw firebombs and rocks at an IDF base on Mount Scopus, at Hebrew University buildings and at police vehicles. At least two of the teenaged terrorists are linked to the DFLP (Democratic Front for the Liberation of Palestine), a hard-left terror organization.